After 1945, Moorehead, with his Australian accent eliminated, turned his back on lucrative offers from Beaverbrook to stay in his job. He decided to change shape again and become a proper writer like his idol Hemingway. As a child in the 1960s, many of his books were on our family bookshelves. The derring-do of the imperial explorers fascinated me – though when I re-read them years later, the locals were often secondary to the colonial narrative. I say “hybrid” as this work was patched together from disparate drafts by Mooreheads’s wife, Lucy, after the writer was incapacitated after emergency surgery for a blocked artery that went horribly wrong. Restricted in speech, incapable of writing, Moorehead’s career was over by the end of 1966. He was then just 56, but he lived on until 1983, surviving Lucy by four years. That said, to say McCamish doesn’t offer any major reassessment of Moorehead (though the analyses of his many books and articles are discerning) is to misunderstand what this book is about. This is not a conventional biography, though all the materials are there and the research is impeccable. Instead, McCamish is part of the story. The opening chapter, Notes on a Disappearance, reviews Moorehead’s current status: largely unread, obscure, revived by scholars but without the general public he once possessed. McCamish takes us though his visit (with family) to Italy, where Moorehead once lived, his discussions of Moorehead with his friends and how he read all of Moorehead’s works devotedly, tracking down even the most marginal magazine piece. Later on we are told that, “at some murky, furtive daydreaming level”, McCamish wants to be Moorehead. This is a biography where the author often stands in front of the scenery. Personally, I would have liked McCamish to have stepped back and left the story to Moorehead. But that is to impose my own preferences, rather than take this book on its own terms. McCamish shows how Moorehead was subject to the fickle opinions of Australians back at home. He could be our boy made good or he could be a self-appointed expert, resented for his success. This, incidentally, was grossly unfair to an author who did not assume the role of the expat who knew more about this country than those who had stayed behind. Moorehead might have rejected Australia in 1936 but he spent some time rediscovering it. Even the nature of war journalism has changed in many ways, with conflict going live to air, and the demand for instantaneous reporting often replacing close analysis. Al Jazeera is the go-to outlet for news on the Middle East today, not the correspondent from the Daily Express. War correspondents might become nostalgia themselves. Women war reporters certainly deserve more attention. A good beginning was made by Jeannine Baker in her recent book, Australian Women War Reporters: Boer War to Vietnam (2015). Kate Webb, who covered wars from Vietnam to Afghanistan, and who has to be Australia’s greatest woman war correspondent, is crying out for a biographer as sympathetic, as hard working and as skilled as Thornton McCamish. Our Man Elswhere: Searching for Alan Moorehead (2016) by Thornton McCamish is published by Penguin Books Australia. 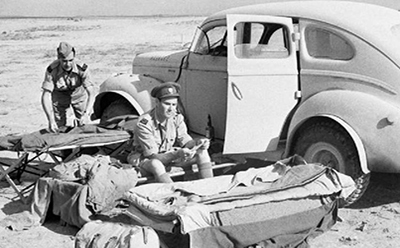 Image: Journalists Alexander Clifford of the Daily Mail and Alan Moorehead of the Daily Express in the North African Desert, 1942. Imperial War Museum, via Wikimedia Commons.